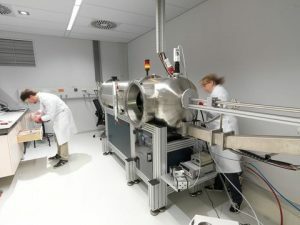 Normally, in the transmission mode, the X-Ray is sent through the sample and due to electron inhomogeneities within the nanostructured sample, the radiation is scattered. By measuring the angle-dependent distribution of this scattered irradiation, information about the structure of soft matter can be determined. The GANESHA 300XL is equipped with a GeniX-Cu ultra low divergence source (l= 1.54 Å, flux of 1×108 ph/s), a Pilatus 300K silicon pixel detector (487 x 619 pixels of 172 x 172 μm2), a Linkam temperature controller (-80 – 250 °C) and a Julabo temperature controller (-5 – 80 °C). The different configurations give access to a q-range from 0.003 to 3 Å-1 (Small Angle X-ray Scattering -SAXS- and Wide Angle X-ray Scattering -WAXS-). Alternatively, in the reflection mode, also called Grazing-incident Small Angle Scattering (Gi-SAXS), the X-Ray is sent almost parallel to the surface of interest, hence providing information about nanostructured surfaces or thin films. The flexibility of the equipment allows to measure a wide diversity in samples, ranging from thin polymer films, bulk materials, colloidal dispersions, proteins in dispersion and hydrogels. Samples can be examined at different temperatures.